These ancient vines most likely found refuge on the Iberian Peninsula during the Ice Age and gradually retreated from alien varieties with successive Phoenician, Greek, Carthaginian, Roman, Arab and Crusader populations (Vine to Wine Circle). But fascinatingly, some Vitis sylvestris still flourish today - particularly in Navarra, one of Spain's 17 first-level administrative regions, located just north of Rioja in north-central Spain. This region has a Mediterranean climate that is moderated by its proximity to the Bay of Biscay (Atlantic Ocean) in the northwest, the Pyrenees in the northeast, and the Ebro River. It gained its DO status in 1933, but because of its diversity also includes five sub-zones: Baja Montana in the northeast, Valdizarbe in the north, Tierra Estella in the northeast, Ribera Alta in the center, north of the Ebro, and Ribera Baja in the south below the river. A small section of Navarra is classified as Rioja DOCa (Denominación de Origen Calificada). Traditionally, Navarra has been strongly associated with its rosé wine (rosado), with Garnacha producing the best examples. However in the 1980’s, the official state laboratory of Navarra (EVENA) deducted that red wine blends were the future of the region and Tempranillo, Cabernet Sauvignon, and Merlot were widely planted. 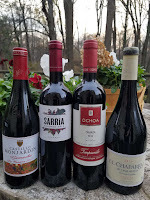 We recently received four red wines from Vinos D.O. Navarra which showcase the powerful and elegant nature of their two most popular grape varieties: Tempranillo and Garnacha. The first is considered the "great ambassador" of Spanish wines and accounts for 33% of grape plantings in Navarra whereas Garnacha (indigenous to the Ebro Valley) accounts for 23%. Javier Ochoa has been producing this 100% Tempranillo wine since 1987 from grapes sourced from their Santa Cruz estate. One year aging in American Oak plus some rounding in the bottles provides a medium bodied texture wit fresh sour cherries, dense dirt and chewy tannins. This wine has the least amount of the Spanish noble grapes as it is a blend of 60% Cabernet Sauvignon, and 20% each Graciano and Garnacha. The grapes were sourced from vineyards planted in limestone and marl near the town of Puente la Reina -- "the crossroads of the ways" -- a medieval town where the two main routes on the Pilgrim's Way to Santiago de Compostela converge. After fermentation the blended wine was aged 12 months in American oak that shows oaked vanilla and spices along with a juicy and earthy character that finishes with smooth tannins. This winery is located in the sub-zone Valdizarbe and this 100% Garnacha comes from vines planted 70+ years ago. The hillside vineyard consists of porous marl and sandstone and benefits from large diurnal temperature swings - slowing growth and enhancing acidity. After fermentation the wine was aged five months in French oak providing some vanilla and spices to this bright, fruit forward wine. This estate was founded in 1988 and the Garnacha is sourced from 70 year old vines on the La Cantera vineyard. "La Canera" translates to "quarry" which describes the vineyard's rocky and poor soil where vines must root deeply in order to produce even its low yields. Combined with 15% Sauvignon Blanc, the grapes are fermented in stainless steel then aged six months in French oak and 6 months in the bottle before release. This is a jammy wine, fill of bright dark fruit, noticeable tannins, and finishes very clean.